We are visiting the Champagne maker Canard-Duchene in the Montagne de Reims countryside. A patchwork of neatly hedged, close to leaf-manicured vines line each side of our road and extends into the distance, clinging to the soil of its appellation. It is quite wondrous. Canard-Duchene is nearby to the quaint village of Ludes, and the vineyards extend right up to the village streets, and into some back gardens. That’s how valuable these appellations are! Our France wine tours take guests through the villages of Champagne; the Cotes de Blancs and la Montagne de Reims, offering introduction-only visits to houses, only some open to the public. If you’d like to find out more about this exclusive guided experience for lovers of wine and food, you can call me direct on +61 427 705 391 or email denisew@uncorkedandcultivated.com.au. This day will be fun. We are to learn about how Canard-Duchene make and age their 14 million bottles of bubbly stocks, and some lucky travellers will perform the old art of sabrage. That is the medieval act of removing the cork from the champagne neck with a sword. It chops off some glass but you can drink the fizz after thankfully. And Canard-Duchene wine is found in 54 countries internationally. It was a favourite act of Napoleon Bonaparte to celebrate a battle victory. Canard-Duchene’s cellars underground are extensive. Inside and beginning at 34 metres into the damp chalk below are large, long, parallel cavernous tunnels (extending to 6 km) carved out over time on four levels since establishment in 1868. Our first super drink is Canard-Duchene Leone Green NV, green label too, to signify production from organically-grown grapes; a practice on the increase here. Bubbles with a top perfume of crackling yeast, super dry, taut, bright and fresh. Sante. The team was ever-so-eager to taste Canard-Duchene’s 2008 Vintage. This is recorded as one of the best of the decade with universal great longevity expected. It is a wet and cold year but for the grapes that made it through gave enormous minerality, zippy freshness and expectations of a long time for the high acids to come into balance. So eight years in bottle here has barely tamed this fruity style, expect more, keep some. The pinnacle set of wines is Canard-Duchene Charles VII Blanc de Noirs and Blanc de Blancs NV; single style wines from red (two pinots) and white (chardonnay) grapes. Charles was the smart French king who worked out how to dispose of the English at the end of the 100 years war (1337-1453). This is expressive chardonnay; the house has vineyards and buys grapes in the best Cotes des Blancs villages south of the mountain; the fruit personality of this chardonnay is self evident, the flavours come out deliciously. Drink some. 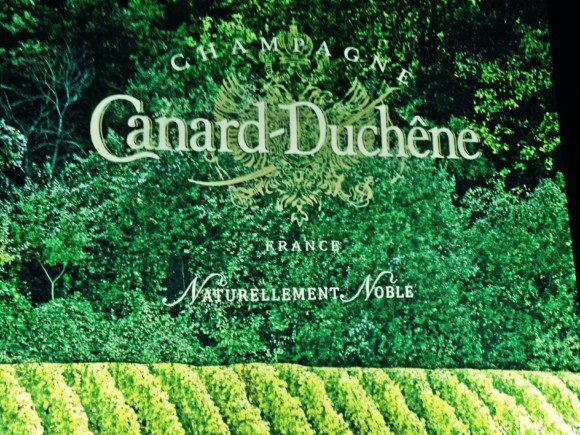 Canard-Duchene require an equivalent of 400 hectares of producing vines from 60 village origins annually to supply their French market which is its largest (70% sold), and also keep Australian drinkers happy. After a visit to this part of France you will never forget the closely-clipped hedges of grapes and the vista which extends to the horizon; all 33,000 hectares of it. 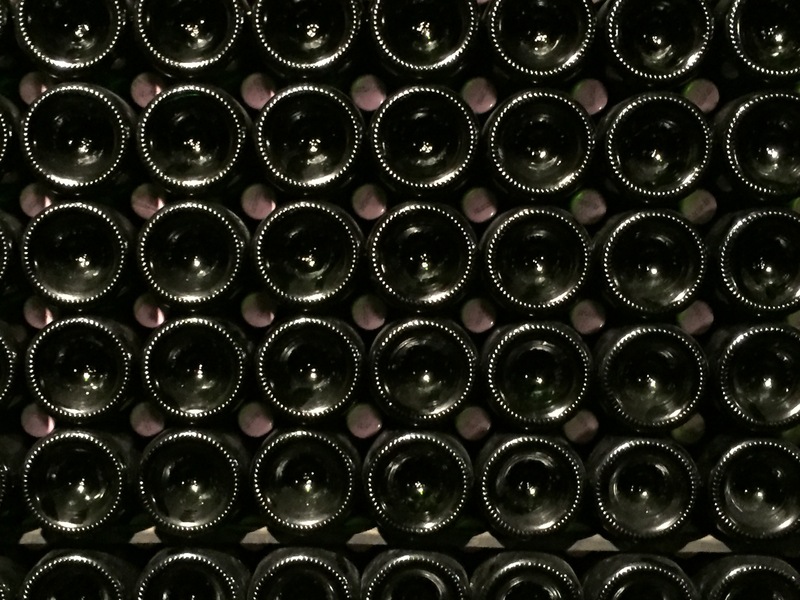 Champagne is a terrific wine sparkling region, now UNESCO-listed. There are so many bubble makers. And Uncorked’s mission for travellers is to visit a clutch of houses of bubbles, take happy groups into very dark and cold places, then emerge into sunlight to drink the fizz they make. In 2016 the Champagne visit list read: Bollinger, Canard-Duchene, Charles Heidsieck, Krug, Pol Roger, Taittinger, Tresors de Champagne Boutique, Veuve Fourny and Veuve Clicquot. A good geographic selection. Some are corporate makers (think Louis Vuitton Moet Hennessy-LVMH), some are collectives (Tresors) and the rest are private family businesses. All types comprise Champagne and there are many tastes. The cultural side of this writer says Champagne drinkers need to appreciate all offers from all houses (if there is time to taste everything); or better still visit Champagne for some structured indulgence and first-hand plays. Champagne bubbles are great levellers. Of course it is the national drink in cities like Reims or Epernay, and again in the quaint flower-box lined villages like Verzenay and Vertus. And these collections of picture-perfect stone cottage aggregations are dotted all over the Champagne landscape. The production around each village is defined in the appellation, by its boundaries (just like a shire or city boundary). One is called Chouilly. Champagne has 33,000 hectares of grapes in the Champagne-Ardennes prefecture, selling 315 million bottles a year. As regions go, only Languedoc and Bordeaux sell more bottles. 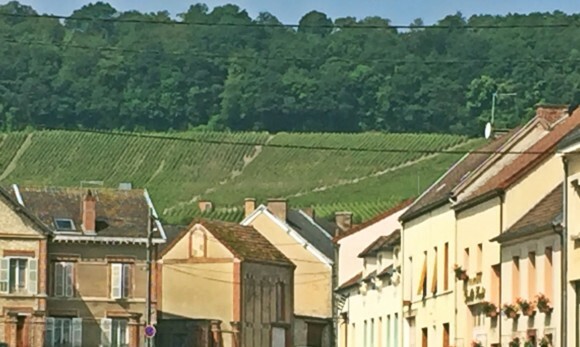 So there is an appellation of Chouilly which is defined as grand cru for grower payment purposes (sold grapes); this village produces mainly chardonnay. A top presentation came from Chouilly grower-producer Carol Champion of Roland Champion showing off a great Grand Cru Blanc de Blancs Brut Carte Blanche NV (all chardonnay, 2012 bottling) at the Tresors Boutique. There are entities who buy grapes (negociant brands) because they grow too little, those who sell grapes (growers) to negociants and those who make Champagne from just the grapes they grow (grower brands). The small and the large. Veuve Clicquot is large, Veuve Fourny is small. Both make different wine. (Veuve is French for widow by the way). Veuve Clicquot in Reims presented their standard drop, Yellow Label Brut NV, with a label colour you cannot miss, so bright it is in one’s face. And it was impossible to resist the more elite La Grande Dame 2008 (contains 8 grand cru villages), lovely, lithe, memorable. Veuve Fourny’s Charles Fourny, part of the small concern, showed with family passion Grande Reserve Brut Premier Cru NV from his native village of Vertus (2012 bottling, 80% chardonnay, 20% pinot noir). From a chardonnay village; lithe, long and delicate. On the Avenue de Champagne in Epernay, at Pol Roger’s most drinkable address, poured were two of the now-saluted 2008 harvest wines, Blanc de Blancs and Rose, both definingly different, delicious, deep and positively enchanting to the mouth. Rose has body. Nearby in Ay, after touring the underground tunnels that store reserve wines in magnum size quantities, Sonia de la Giraudiere from Bollinger poured two glorious vintages, 2005 and 2002 which epitomise oxidative-style base wine fermentations in old barrels, the Grande Annee and then RD (recently disgorged or older vintage yeast removed and sold later). At Ludes, which is in the countryside on the Montagne de Reims, Canard-Duchene’s Aurelie Lelarge chose the clever Cuvee Leone Green Brut NV, a responsible organic fizz with creaminess, delicacy and streams of nice fresh brulee yeast characters. Yum. The Leone range is exciting. Back in Reims it was time to visit one of the five houses with Gallo-Roman excavations, made as deep as 30 metres around 200 AD into the mountain of chalk which sits within the city. 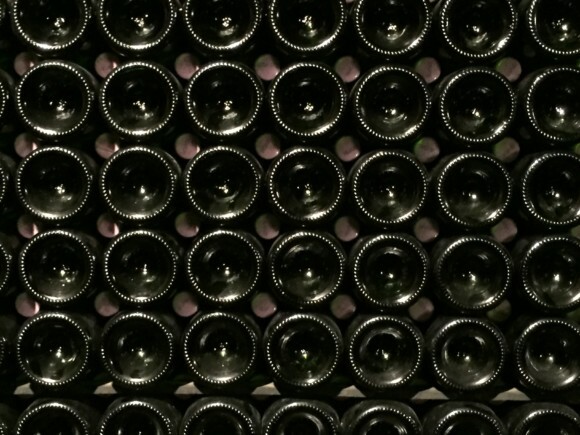 These crayeres have a peculiar shape due to the special engineering feats of the Romans, now adopted by Champagne makers such as Charles Heidsieck post the French Revolution to store champagne. The natural temperature of 9-10 oC slowly matures the wines. Dominique Cima-Sander presented Charles Heidsieck 2006 twice, at a pre-lunch tasting, then with a plate choice of crevettes, potato, fresh asparagus and orange sauce. The wine has good spine but now also a roundness to make it fine drinking today, and a good recollection of the year in Heidsieck’s vineyards. Sebastian at Krug presented the 2016 release of Krug 2002, which came alongside the much-discussed Krug 2003, with a truly hip blackboard menu displaying the Krug identity code of each bottle. Wines are outstanding, deep, different, powerful, masterful, both long livers. Christine Tellier of Taittinger took travellers into the once historic Reims Church-owned crayeres to view the famous company blanc de blancs aging on lees in all sizes from 375 ml to 15 litre. Later pouring Comtes de Champagne 2006, personified in its elegance, always a poised wine, white flowers, with delicacy and freshness. Wine to love. Never miss tasting this. Start the voyage, never miss the opportunity. This was the writer’s 16th visit, twice as Vin de Champagne Laureate, 1985 and 2014.